Stefano Manfredi "I am Italian. And I am a cook. But I live in Australia and whenever I can, I seek out and use only the finest and freshest Australian ingredients." Fresh From Italy, 1993. Italian chef Stefano Manfredi and leading Australian coffee roaster for D.E. Master Blenders 1753, Wayne Archer, will launch a family of blends for Espresso di Manfredi in February 2013. 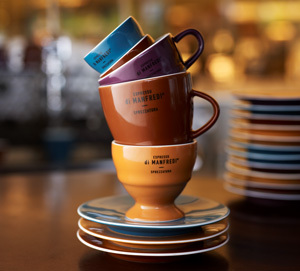 Following the launch of their Classico blend in 2000, the duo will release Audacia and Chiaro blends along with a range of Ceramica di Manfredi, a colourful collection of ceramic cups. Chiaro, a delicate blend, is a citrus-based coffee with honey notes and sensations of chocolate, vanilla and orange peel, with a cherry finish. The blend is lightly roasted using a high-grown Papua New Guinea coffee. In contrast to the Chairo blend, Audacia offers bold flavours with a rich, tangy syrup nature and dried fruits. It carries a punch that cuts through milk-based coffees. The dark roast is comprised of Sumatran and Indian Arabica beans and a touch of Kenyan beans. “It was intriguing and curious to hear Stefano’s descriptions of what I would call body or acidity. He would say something different to my coffee jargon. It was always an interesting exchange of views,” says Archer. The new additions to the Espresso di Manfredi range are said to capture the italian essence of ‘Sprezzatura’, meaning the “effortless mastery of one’s own style”. Stefano immersed himself in the café culture at an early age when he lived above a café in the town of Gottolengo in Lombardy, Italy, before migrating with his parents to Australia. He has since opened numerous award-winning restaurants including Manfredi at Bells in 2007 and Balla in 2011.